Another 21 wins & 9 nominations. the more people see it, the more people there are to help me work out what to make of it. It's hard not to like, and the central conceit, the fantasy story of someone whose entire life is spent crossing and re-crossing the Atlantic, is just delicious - yet there's always something that prevents it from working as it should. There's too much narration. Narration aside, there are too many words. Just before 1900 and the narrator part ways the former explains himself, to some degree, in a longish speech. The speech was necessary: we needed to hear his reasons from his own lips. But once it had been given the scene should have ended. Instead the two characters keep adding postscripts as they walk away from one another - and they're standard, maudlin things which are at odds with what 1900 had been saying a moment ago. Again and again, there are words where there shouldn't be. But then, it may be that the title character was given too FEW words - at least at first. Because it's so long before we first hear 1900 express his thoughts verbally (and because in the absence of other information about his character we are unwilling to pass judgment on him until he does) it takes too long for us to warm to him. In fact we never warm to him as much as we should. And yet there are scenes - the piano duel, the girl in the rain - that are just fantastic, that make me reluctant to criticise anything at all. Any film containing moments like those can afford to lose its way at times. P.S. Of course, a film about a pianist born on the first day of the Twentieth Century ought to be called "The Legend of 1901", which if you asks me sounds better anyway. 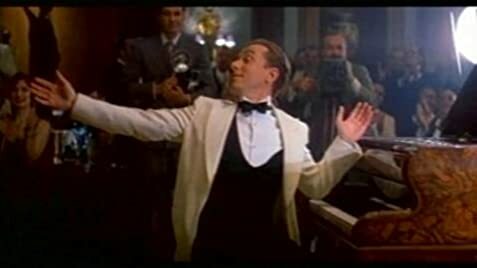 Tim Roth can not, in fact, play the piano. He trained for six months just to be able to "fake it" for the film. When the passengers first see the Statue of Liberty, it is shown reflected in the sea. However, the reflection appears to be an image of the statue laid flat on the surface of the water, whereas a real reflection should appear to extend straight down below the surface. Original version released in Italy is 2 hours and 45 minutes long. A 123-minutes version premiered at the Locarno film Festival in July 1999. This shorter version is the same released in the USA by Fine Line under the title "The Legend of 1900". What is the greatest Legend ever told?